Keep reading to discover the various bonuses and promotions on offer at MyBookie.ag, and to discover why we believe they are a gambling site worthy of your business. MyBookie offers all new customers a 100% up to $1,000 bonus on their first deposit, which is perfect for giving your bankroll a boost as you delve into the world of online sports betting. Getting your hands on the bonus is a simple task, simply create your free MyBookie account, make your first ever deposit of at least $50 using the bonus code MYB100, and MyBookie matches it 100% up to a maximum of $1,000. The rollover requirements for the welcome bonus are between five and fifteen times depending on the bonus amount awarded, so be sure to check with the MyBookie customer support team by emailing help@mybookie.cr to find out the exact rollover terms. Like most online sports betting sites, you are not allowed to make a withdrawal within 30 days of claiming this welcome bonus, and you can only use the free plays to bet on straight wagers on major sports. You may use the free plays on moneylines whenever the line is between -200 and +200. One area that you immediately see MyBookie excels in is its ongoing promotions, of which there are several. In addition to the 100% up to $1,000 welcome bonus, MyBookie customers can enjoy a 25% up to $500 reload bonus when they use the bonus code MYB25 at the time of their deposit. This reload bonus carried a five to fifteen times rollover depending on the bonus awarded. Other exciting promotions include a 7% rebate on your horse racing bets, a 100% up to $100 refer a friend bonus, a $20 risk-free bet, a 10% World Series future play, a $25 free bet if you have 10 winning picks in a row or $50 free play if you have 20 picks correct. If you hit a bad streak in your bets and lose 10 bets or more in a row, MyBookie gives you $25 to get back on track – this does not apply to bets placed with free plays from other bonuses. Connect with MyBookie on social media and receive $10 free play, and double your money on NFL bets if you correctly pick spread bets on every game on the board! MyBookie.ag hand-picked its teams from some of the most experienced and highly skilled online gaming professionals in the world and it certainly shows in all aspects of the website and overall product. The company states it has created the world’s leading online sports betting sites through the fundamental three R’s: Reliability, Reputation, and Real fast payouts. It achieves all three of these markers with ease. 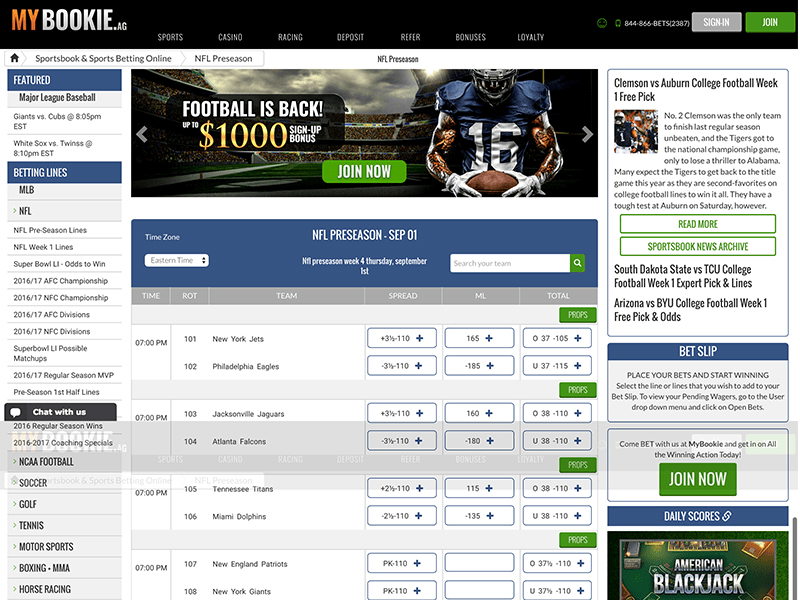 The MyBookie website recently received an overhaul to make it faster, slicker, and easier to use. The company also became a fully licensed and legally authorized online gaming entity, something helped by it installing 256-bit encryption and secure socket layers certificates; those last two make MyBookie one of the most secure websites in the world. Payouts are usually processed and made within 48-hours of being requested, and you could be taking advantage of these quick payouts on a regular basis thanks to the plethora of bonuses and promotions available to MyBookie customers. Create your MyBookie account via our links and you may never need to visit another online sports betting site ever again. If you are taking advantage of the 100% up to $1,000 initial deposit bonus, the minimum deposit amount required to trigger it is $50, meaning the smallest bonus you can receive is $50. Conversely, the maximum sports betting bonus you can receive at MyBookie is $1,000. As for the reload bonus, this is a 25% up to $500 bonus so the least you can receive is $12.50 as the minimum deposit amount is $50, while the most you can receive from the reload bonus is $500. The bonus terms and conditions on the MyBookie website are quite vague, stating the rollover requirements for both the welcome and reload bonuses are between five and fifteen times depending on the size of the bonus awarded. Although there isn’t a racebook specific bonus available to MyBookie customers, MyBookie does have a fantastic offer of a 7% rebate on horse racing wagers at its racebook. The rebate does not apply to horse matchups or other future wagers made through the sportsbook, nor do you receive a rebate on Win, Place, or Show tickets that pay $2.20 to $2 or less. These rebates are paid daily after 12:00 a.m. and there are no rollover requirements associated with the rebates. There are three bonus codes that you need to commit to memory if you want to boost your bankroll at MyBookie. To claim the 100% up to $1,000 welcome bonus at the sportsbook, use the bonus code MYB100, while you should use the bonus code MYB25 for the 25% up to $500 reload bonus. Casino bonus hunters should enter MYC100 to get their hands on the 100% up to $300 first deposit bonus. If you love to play casino games from the comfort of your own home then you’re in luck because MyBookie offers new casino players a 100% up to $300 welcome bonus. Make your first ever deposit onto the casino site using the bonus code MYC100 and MyBookie matches your deposit amount 100% up to $300. This MyBookie casino bonus commands a 50-times rollover requirement and the requirements need to be met within 30 days of your bonus becoming active otherwise the bonus is forfeited. At the time of writing, MyBookie does not have an online poker product for you to play on. This may change in the future so if you’re a poker player keep checking back to this page.